Happy Friday and almost Halloween! Last night I was persuing Twitter and heard about how for a limited time Nordstrom is price matching these Original Tall Hunter Boots to Costco's price of $80!! That's almost HALF OFF! I had to share with you guys because hello, deal obsessed over here! and I know the normal price of $150 isn't ideal for rain boots. Everyone always ask me if they are worth it (they are), but now is the time I would definitely buy them if you've been on the fence! I wear mine all the time in the fall/winter (like every week) and they make the most adorable socks for them now, so your feet will be extra warm. I never knew Costco sold Hunter Boots but apparently they do (you go Costco!) so Nordstrom is only offering this special price for the colors/type that are available on Costco's website. 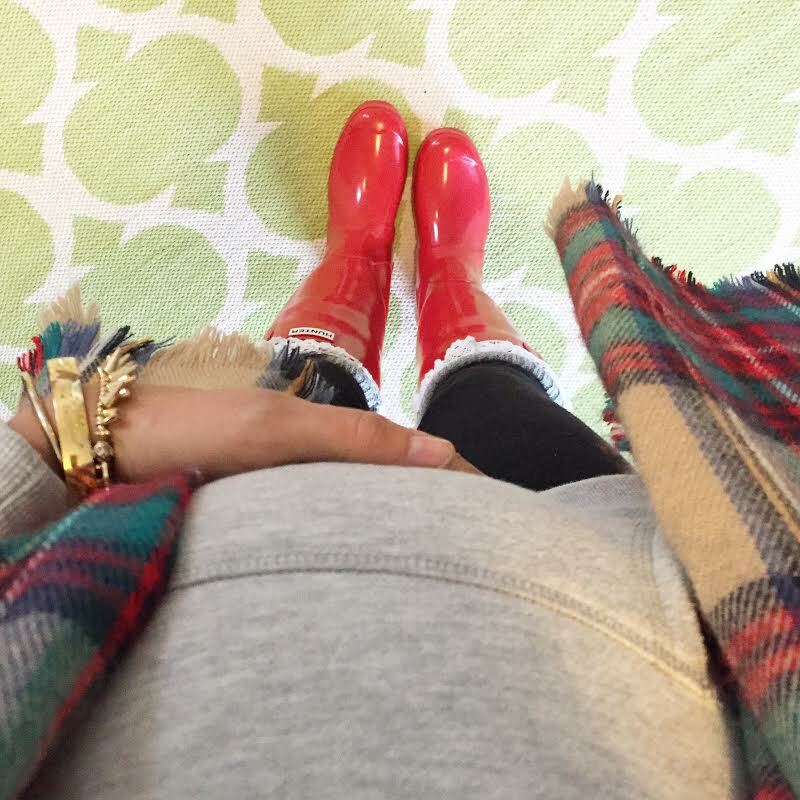 This includes the Tall Original Hunter Boots in Red, Navy, Hunter Green, and Black (in gloss or matte!) and also many of the Short version as well. Just make sure the ones you want are available on Costco's website (view them all here) before purchasing with Nordstrom. Also, I did look into this just to make sure it was legit and it is! I "live chatted" with Nordstrom last night and they confirmed to me that all you have to do is place an order and send them the order # and they will adjust the price. If you feel more comfortable, you can "Live Chat" yourself on Nordstrom's website and they will give you the full instructions on what to do. How do you go about getting the price match? Not sure how this works, but I tried talking to Nordstrom about it and they wouldn't match the price since they couldn't put Costco items in a cart. How did this work for you? I just hit "Live chat" on Nordstrom's website and asked how to get a price match to Costco's Hunter Boots that are on sale for $79. She told me that to qualify they style/color needs to be available on Costco's website and then you place your order and they will adjust the price for you. You can even give them the exact color you want and they can tell you if it applies. If it's available on Costco's website, they will price match it. How do you see the price on Costco? How much are the short boots do you know? I see them on Costco's website and I bet Nordstrom would price match those too! I think you have to be a member to see the price but the tall are $79 and the short ones are $69. Yes they will price match the short ones too! You just have to place an order and then send Nordstrom the order # and explain the price match and they will adjust it for you. You can ask them how it works in the "live chat"
It worked for me! Just got short gloss black boots for $69 instead of $140! Thanks!! They must look it up themselves. I did the live chat and asked them to price match it - and I'm not a Costco member, so I couldn't see the prices myself. And they honored it. They don't need to see it necessarily, you just tell them the price (but I believe all the reps should know about the price by now because it's been so popular) You just send them your order # and they will adjust it for you. If you want the tall they are $79 and short are $69. Yes!!! I snagged a red pair from Nordstrom yesterday for $79.99!!! I love that they are doing this! I am bummed. I have talked to two and since Costco doesn't have my size they will not match. :( But what a great deal! Yes, your size has to be in stock to get the price match. Are all the colors sold out in your size? Because I see lots of sizes available in the colors! I did the price match and am wearing my NEW Red Hunter boots today!! Happy Friday to me!!! The only thing I'm mad about is I should have bought 2 pair at this price!!! this is so perfect! thank you SO much for sharing. just added these officially to my Christmas list this morning :) you're the best deal finder, Katie! Haha :) no problem, love me some good deals!! You made my day!!!!!! I am a member of Costco so I'm just ordering directly from them! I didn't even know they sold them! THANK YOU! have a great weekend! You're so welcome! Such a good deal! OMG. Thank you for sharing. I was seriously considering buying the kids size since they are already less expensive but I really wanted the short boots which they don't make for kids. Read this and immediately bought the exact pair I wanted. Love Nordstrom!!! Me too! They make it so easy! Happy to help girl! I do not have a membership to Costco. Can anyone tell me if Costco has any colors in size 8 left? Glossy graphite, glossy navy, matte black, matte green, glossy black, matte red, matte olive (looks like a tan color, not green) - these are all TALL. They're all backordered a few weeks. Hope this helps! Thanks for the tip! Too bad they have to be in stock for the price match... happy I just renewed my Costco membership. Okay so I already have some Hunter boots - my issue is do I also need the gray ones? So tempted to snag another pair! love my hunters! and such a great price! for anyone on the edge about ordering, do it! Just reading this now!! Busy few days..my loss. My membership is not active at the moment. does anyone know if these are still available in tall glossy red or black in size seven. Thanks in advance for your help!!! I would really like to order some! Just got the hunter green pair I've been waiting for like two years!! THANK YOU for sharing this!!! You rock! I just snagged my first pair at the store today. I could never bring myself to pull the trigger on the price! They are still price matching and even had a sign near certain styles of boots in the store. The sales rep said she wasn't sure how long this would last though. But thank you so much for sharing! Costco restocked!!!! Just scored some black glossy hunters for $79.99! Thank you!!!!! QUESTION - couldnt i potentially purchase a pair from nordstrom and when i go in, try them on, they might not fit and i can simply ask to exchange to a different size? i couldnt imagine they would upcharge me at that time?? here is my example: green matte is available at costco in size 7. i'm on with nordstrom now ordering the 7 - but i figure i likely need an 8. Couldnt I get the 7 shipped to my home and then take them back to the store to exchange and get the 8?? And I'm thinking they wouldnt upcharge for the difference?? I did the live chat with Nordstrom and all I said was that Costco had them for $79 and they are selling them for $150 and someone told me they would price match. If you place the order through live chat they don't ask anything other than the item#, size, and color. That's it. Mine went through without a hitch. Nothing was asked about being in stock in my size at Costco or anything. Good luck ladies!